It all started with a need. 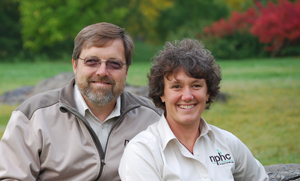 Now a Division of Bartlett Tree Experts, Northwest Plant Health Care Inc. was founded in 1996 by Joe and Kate Zubaly (above) and was born out of a need in the marketplace for a professional, information-based service that meets the needs of its clients by utilizing research driven modern arboricultural practices. Our ultimate goal is developing long standing client relationships through quality customer contact, relevant information exchange and the promise of aesthetically pleasing plants. We focus on improving the health and vigor of trees and shrubs. As a result, our clients benefit by enjoying: healthy beautiful plants, increased property value, decreased maintenance costs, informed, mutual decision making, and environmentally sensitive practices. We look forward to being a part of the future success of your landscape.